The integration of agriculture and forestry is commonly viewed as a foundation for sustainable livelihoods for small-scale farmers. In many tropical countries, traditional farming practices by smallholders include some trees or forest management for multiple purposes. This article reports on research that explores the experiences of smallholders in Central Java, Indonesia, who are increasingly blending aspects of their traditional farming practices with cultivation of commercial timber trees. Smallholders manage complex farming systems that are responding to the demands of commercial markets. Smallholders in Central Java typically manage a wide range of species that yield short-, medium- and long-term products that are used by households and sold into commercial markets. 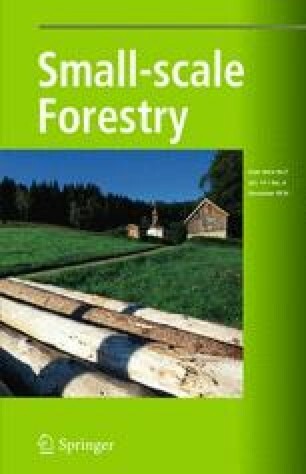 However, the authors’ research indicates that smallholders may not be optimising their forest management in relation to the potential financial returns, leading to a lower expectation of the value of forestry to their livelihoods. Support for community forestry could address several knowledge gaps amongst smallholders, so that community-based commercial forestry achieves its potential. The authors express their warm appreciation to the smallholders and district forestry staff of Central Java who kindly gave their time to discuss their experiences about community forestry. Also, the authors thank their many colleagues working on the research project ‘Overcoming Constraints to Community-Based Commercial Forestry in Indonesia’, to which the information reported in this article contributes. The research project received financial support from the Australian Centre for International Agricultural Research during 2011–2014. The authors thank Steve Harrison and two anonymous reviewers for their constructive comments on an earlier draft of this article.